Hyundai’s second EV, the Kona Electric, gets a 292-mile WLTP range from a single charge in its highest, 64kWh specification. Prices start at £24,995 for the lesser 39kWh version, including the Government's £4500 plug-in car grant. The small SUV, the first EV in the segment, has two battery options, with the lesser option providing 186 miles of range from a 39.2kWh battery pack. Both variants have 104mph top speeds and 291 lb ft of torque – the same as the Alfa Romeo Giulia Veloce. It'll be revealed in the metal at this year's Geneva motor show. The 64kWh car costs £29,495 - a £4500 premium over the 39kWh car, and £2205 more than the entry-level Nissan Leaf - its closest rival. Orders open in August, with first deliveries likely commencing a few weeks after this. The shorter-range version, which has a 131bhp motor sprints to 62mph in 9.3sec, while the longer-range, 198bhp variant takes 7.6sec, or the same as the Toyota GT86. Efficiency for both engines is as yet unconfirmed, but Hyundai is targeting 15.2kWh per 62 miles under the new WLTP testing regime. The charger port is located next to the Hyundai badge at the front of the car. Hyundai claims that the car’s battery pack is integrated into the Kona’s platform without encroaching upon interior space, meaning that the regular Kona’s luggage space is unchanged. Without the charge cable, the Kona Electric provides 373 litres, falling to 332 with the cable stowed. There’s additional storage space in the front of the car. 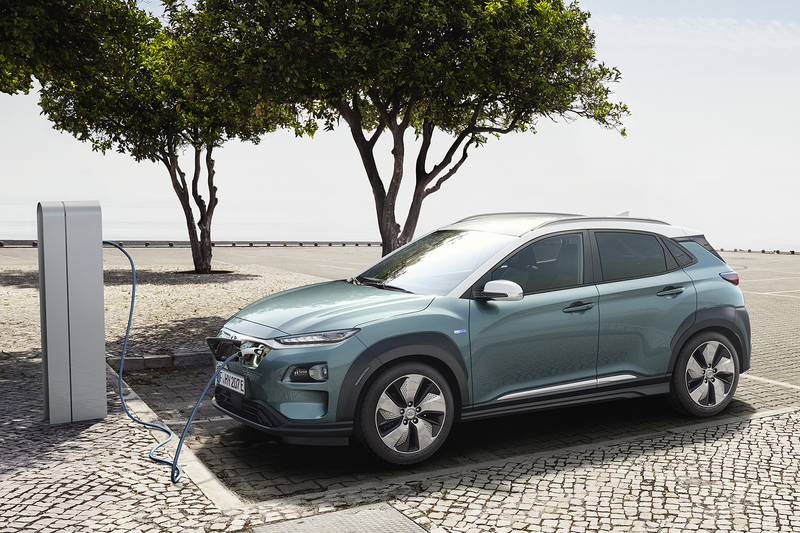 The Kona Electric’s lithium ion battery pack can be charged in as little as 54min to 80% capacity from a 100kW fast charger in long-range form, or 9hr 40min from a standard AC source. The same fast-charge time applies to the short range car, but the standard AC charge time falls to 6hr 10min. On the outside, it’s similarly styled to the regular Kona, but has a closed grille and no exhausts, while the 17in alloys are exclusive to the electric Kona. The bumpers and spoiler are tweaked for aerodynamics. Inside, there’s a digital dashboard, head-up display and 7.0in infotainment touchscreen, with the option of an upgraded 8.0in unit, which brings uprated navigation and a data subscription for one year. The front seats are heated and ventilated, as well as eight-way electrically adjustable, with two-way lumbar support adjustment for the driver. A heated steering wheel is optional. The Kona Electric is something of a tech flagship of the small SUV’s lineup, with numerous driver assistance systems, including adaptive cruise control, a lane centring system, rear cross-traffic alert and automatic emergency braking. A five-star Euro NCAP crash safety rating is targeted. 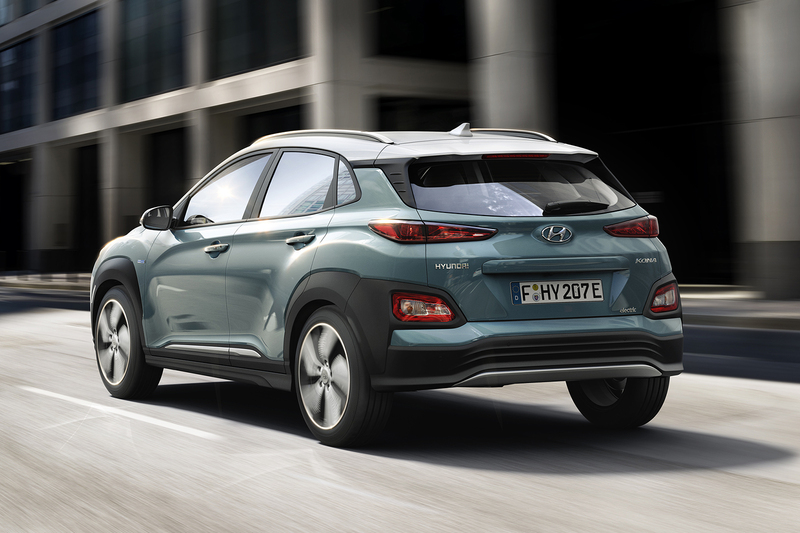 Hyundai is a while off revealing the prices of the Kona Electric given that it won’t arrive in the UK until at least December, but it’s likely to carry quite a premium over the regular Kona. To be competitive with the Nissan Leaf, the Kona Electric carries a premium of aroun £10,000 over the entry-level Kona, but only £1000 above the current range-topper, the 1.6T GDi Blue Drive Premium GT, equipped with four-wheel drive and an automatic gearbox. Hyundai’s first EV, the Ioniq Electric, makes up around 5% of the model’s sales, although with a longer range even in its short-range specification, is likely to sell quicker than the divisively styled Ioniq. Hyundai plans 16 electrified cars in its lineup by 2025. 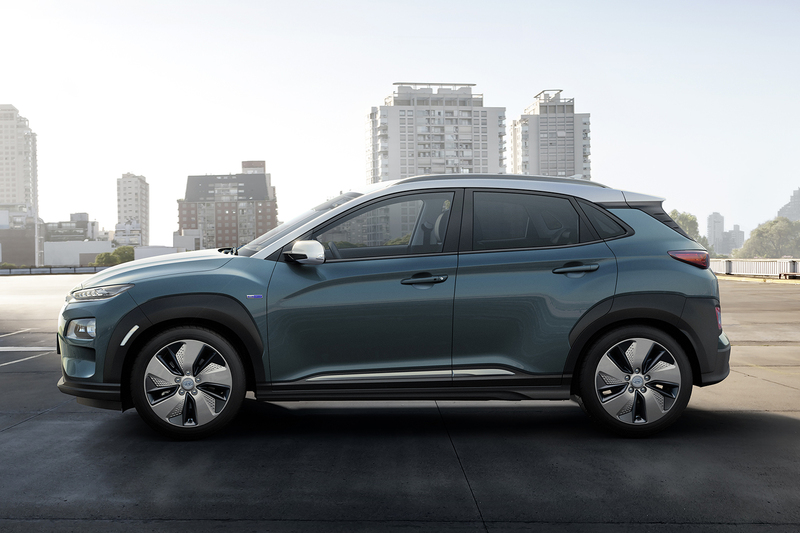 The Kona Electric, recently revealed Nexo, which replaces the ix35 Fuel Cell in Hyundai’s hydrogen fuel cell efforts, and the Niro EV, due in autumn, make up three crucial prongs in the assault, as Hyundai aims to take the lead on low and zero-emissions driving. All seems great. They get the hard bits such as performance and range sorted. They even make it look modern and reasonablt stylish and then they let a four year old child draw the grey plastic wheel arches. What on earth is that about? What line are they taking? How does that improve the look in ANY way. They are all over the place. I really don't get it with some modern designs, especially from Japan. They will do ANYTHING but the simple, obvious and elegant. But Hyundai is Korean with ex-Audi design head at their top. I get it though, its far from being simple and clean. If you don't look back at your car after you parked it, you own the wrong car. Boy does the MK1 LEAF seem decades ago. 0-60 time of 7.6sec, equivalent of 180'ish(?) miles to the gallon, upto 170 mile real world range. Makes you wonder what we'll get in another 8 years. I wish it was not true, but they are at least 10k more than conventional cars, how long will the battery pack last and cost of replacement 5 to 10years guess and £5k approx. Diesel and petrol in the Uk and Europe contribute massively on duty/ vat etc ,the ev is having a FREE RIDE AT PRESENT .IF THE FIGURES OF 15.2 KILLOWATTS DOING 62 MILES INCURRED THE SAME DUTY AND VAT ,THE ELECTRICITY WOULD BE 36P To 40P PER UNIT, NOT SAY 12Pas domestic tariff .ON THAT BASIS ON ELECTIC ALONE IT WOULD REPRESENT THE SAME COST AS A DIESEL CAR . The reason the duty isn’t charged on electricity yet is that we’re being encouraged to use cleaner (electric) cars. At some point the taxation system will have to adjust accordingly. But not for a while yet, which is surely great isn’t it? Incidentally, battery packs seem to be holding up pretty much as well as petrol engines so far, which also cost a lot to replace. Electric cars won’t work for everyone, but boy will this one work for more than it’s predicessors. I’m sure there’s still space for internal combustion for a good few years to come - so no need to be so angry really. Never needed to replace engine - my experience as long as well cared for, engine outlasts more or less everything else in the car. If battery packs begin to outlast in duration the very body parts the car is made out of, then we'd be talking about comparable. Have nothing against electric cars -- however battery pack durability is something I'm watching how is proven in practice. Once there are 15 year old electric cars around, I'll know how it all compares. I stopped reading when your capslock button jammed, but on your first point, do you really think EV's will always remain more expensive to purchase outright? Any casual observer will have noticed the price of EV's have dropped significantly over the last few years, and efficiency has greatly improved. The crossover point when EV's and ICE cars will be the same price (ignoring additional ICE car maintenance) will be around 2020 to 2022. The batteries do not need replacing after just 10 years either - I'm not sure where you get your sources from. 10K more??? LEAF is £22.5k, try buying a mainstream C segment, 180+mpg, 8.5 second to 60 car for £12.5k. battery pack last replacement at 5 years, c'mon even you don't believe this. The Tesla model S taxi's at Amsterdam airport were sold off last month most have done between 300,000 and 350,000 km and still had a value. Oh and guess what they were replaced with, 180 Telsa Model S's. Hi xxxx, the main dubt is how much is more convinient to take an electric one... if you have many km to do for example work or travel - its ok... but in comparison with a simple city car who cross in average 10k kms - the substitution of the bateries will cost more then money you safe in fuel.